If you’ve been wondering where I’ve been for the last few months, since Christmas really, I’ve been hiding out in my house. You see, when Prove It, Josh was nominated for the Silver Birch Express award as part of the Ontario Library Association’s Forest of Reading program, I was faced with having to speak in public to thousands of children and adults. And I was afraid. In fact, I was terrified. You might remember that before the book launch for Prove It, Josh, I joined Toastmasters. I’d like to be able to tell you that I loved every minute of Toastmasters, but the exact opposite is true. I loathed it. That’s not because I didn’t find it valuable, just that having to speak in front of the group, even once I got to know people, freaked me out every week, to the point where it was all I could think about. So after the launch I happily quit. But you know what people say, something along the lines of, if you don’t learn your lesson the first time, you’re doomed to face that very situation again. And as an author, that’s exactly what happens when it comes to public speaking. Sooner or later you have to face this fear. So that’s what I’ve just spent the last six months doing, and not doing well. As a Silver Birch Express nominee, I needed to come up with three different speeches – a 45-60 minute school presentation, a 30 minute presentation with another author, and a 90 second speech to deliver at a microphone in front of thousands. I focused most of my energy on the longest one – the school presentation. I decided Powerpoint slides would help ground me, and give the kids something to look at other than me. I talked to other authors about what they included and then I made several mindmaps and an outline to narrow down my content. Months went by and I didn’t make a lot of progress because I knew I still had plenty of time and Fear and Resistance were whispering in my ear that I was going to be a complete failure and that everyone would laugh at me. That was when I realized that the best way to start my presentation would be with something funny, so that the kids would laugh at me. My idea was to get that out of the way, so that my biggest fear would come true, but on my own terms. And the best way I knew to get a laugh with a North American audience was to joke about my Kiwi accent, so I used the Steak/Stick story as a way to introduce the fact that I have an accent and to give the kids permission to ask me questions if they couldn’t understand me. Once I had the beginning nailed down, I continued on, adding anecdotes and discussing how I became a writer. I told all my writing friends what I was doing, and they all offered advice, support and encouragement. But by the time April rolled around, I was a bundle of nerves and I woke up every night at 3am worrying that I was going to fall flat on my face. It got so bad I lost my appetite and coffee was giving me the shakes. With three weeks to go, I finally finished my presentation. But then my fear solidified into a not unfounded concern that I wouldn’t be able to remember all this content, even with the slides to prompt me. One thing I learned in Toastmasters is that when I stand up in front of a group, my mind goes completely blank. How on earth was I going to do this? For the last two weeks I practised and practised my presentation, by myself in Ginger (parked at the beach) and in front of my neighbour and friends. With all that practice I realized that I would be okay. I even felt somewhat calm at times. You might think at this point I had it all under control, and that I’d defeated my public speaking terrors, but you’d be wrong. I still broke out in a sweat, my hands shook, my mouth was dry, and I stumbled over my words. If you looked closely, you might have glimpsed the terror on my face. But, as Toastmasters had shown me before the book launch, I could do it. I could speak at a volume where people could hear me, and I didn’t embarrass myself by falling off the stage or fainting. I COULD do it. I DID do it. Here’s proof that I did it, although my friend Kathy stopped filming before I started speaking so she could take photos. 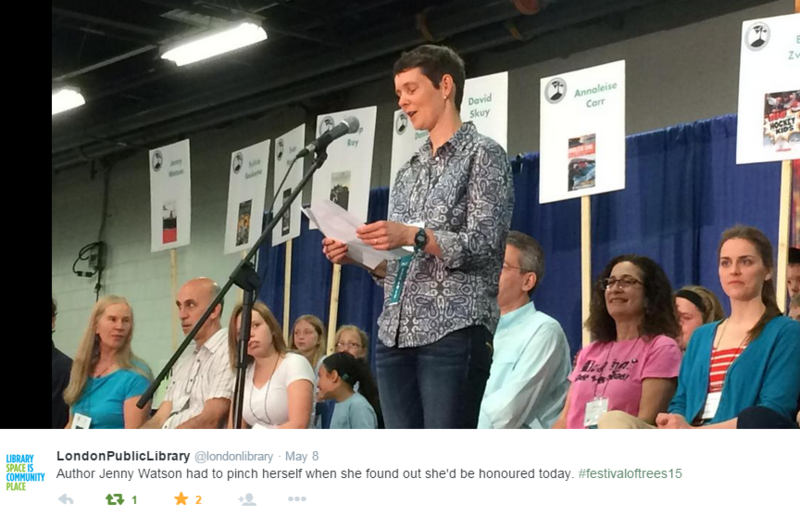 And the kind folks at the London Public Library snapped this picture of me speaking at the London Festival of Trees ceremony. I’ve since read a book called Nerve: Poise Under Pressure, Serenity Under Stress, and the Brave New Science of Fear and Cool by Taylor Clark. The main point I gathered from this book, is that you simply cannot control how your brain reacts to a fearful situation–your brain says fight or flight, or in my case, freeze. All you can do is put yourself in the situation over and over until your brain learns that there’s no real danger. When it comes to public speaking, just prepare your speech and practise it as often as you can. And accept that you will be afraid, but do it anyway. From sheer terror to actually speaking in front of all those kids deserves a huge medal! Good for you and well done!